Production at Eisenhart is a continuous process: from concept and design ... to engraving and printing... to packaging, sample books, and merchandising. All the critical functions have been brought together in an integrated structure that's unique in the industry. So the twin themes of tradition and technology continue through the manufacturing processes- engraving and printing- which add value not only with the machines and the systems, but with the hands and the eyes of the people who run them. There's value added by the hands that engrave the printing cylinders, micron by micron, for the pinpoint registration... by the hands that make the constant crucial adjustments as rolls of substrates speed through the presses... by the eyes that match the colors of the inks and paint with a precision that even computers cant equal. 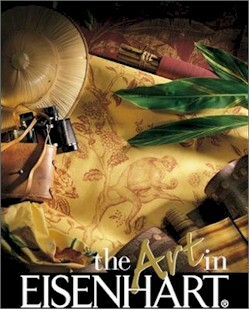 It's the value created by the artisan's touch, the artisan's vision... by the artisan who's never satisfied with "good enough"... never satisfied with anything less than Eisenhart quality.